Before I talk about the contents, Such Small Hands is a beautiful object. Published by Portobello Books, it is one of those books you want to buy simply to hold. The gorgeous green hardback with gold lettering and a terrifying image of a tiny plastic doll, its relationship to the human form so stylised it looks more like a jelly baby than a girl, is a book lover’s delight. The sense of the uncanny delivered by the cover is exactly what the book explores. What we seem to be on the surface, and what desires writhe within makes a frightening topic, especially when its subjects are all little girls. Marina was once an ordinary, middle-class child. Then her parents die in a car crash and everything changes. Badly injured from the accident, she isn’t good at talking to the psychologist at the hospital and so she is given a doll to try to get her to confide in something. So the power of the silent, inanimate doll, the observer, is born. How would this child with such a rich history of experience, both good and traumatic, be accepted in an orphanage of girls who have been living and growing together for years? The beauty of this book is not the story – though that is fascinating – but the way Andrés Barba reawakens the outlook of childhood. The magic of the world that adults so readily forget by focussing on the reliable and repeatable patterns of the everyday, is brought to wonderful and powerful life. This world still exists inside us all. The curious world of emotional power, of misunderstanding, of wonder at the boundaries between the animate and inanimate, the knowledge of good and bad as dependent upon who sees what happens, are all things adults contend with but try to ignore. And the delightful power of words is also entrancing. I’m not going to outline the plot. Needless to say we ought to look at the latent monster inside of us all and this mythical theme works through the telling of the story as well. The girls at the orphanage speak as a collective. They are a chorus of voices connected through their proximity, a community that tries to comprehend tragic Marina at once so pretty and so redolent of unspeakable horrors. Technically, I suppose I would call this book a novella and if I could change anything I would want to see beyond the end point of this narrative. Perhaps I am always greedy for more of a good thing. I’m certainly hugely impressed by Andrés Barba’s writing and I will look out more of his work. 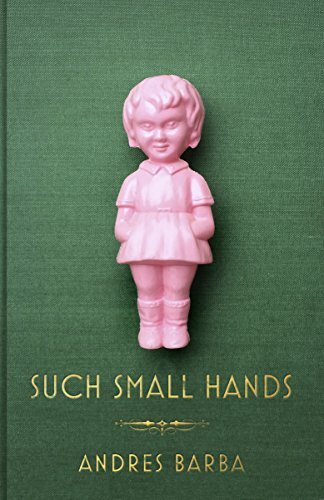 If you like books that cast a spell over their reader, that weave (and here we need to thank the translator, Lisa Dillman) intricate and powerful webs of words, then Such Small Hands is for you. Later this week I’ll be reviewing the latest novel by Heidi James. I’m a huge fan of Heidi’s work and I’m delighted to announce that I’ll be running a book giveaway to celebrate the publication of So The Doves. Watch this space for further details.